Touching and pushing others: sensory or behavior? This is a question we get asked and ask ourselves all the time. This blog series will explore different answers for questions about common behaviors. Mason is very “touchy feely” with his peers. He is always bumping, grabbing, lifting and hugging them. Most of his friends are starting to get annoyed and the teachers find this behavior disturbing and unsafe. 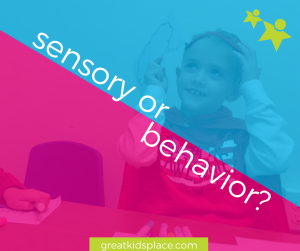 Is it sensory or behavior? Mason is not processing proprioceptive input efficiently so he is unsure where he is in space as compared to others and objects. This causes him to bump into things and people, fall over objects, lean on others, and enter other’s personal space. This also causes him to have a less intense response to hurting himself and others. Mason is Sensory Under Responsive to proprioceptive input. The proprioceptive system provides us with general body awareness and gives us ‘internal’ information from our muscles and joints about where we are in space and where our body parts are in relation to one another. This input provides us with general body awareness and a grounded feeling in the world giving us knowledge (and confidence) on which to base our movements through space. Someone who is Sensory Under Responsive is responding less than what is expected to sensations. They have a higher threshold for sensory input so they need more input in order to respond to the sensation. Mason needs more information from his proprioceptive system in order to meet the demands of the situation. He is receiving less information from his proprioceptive system than his peers hence one cause for the reported behaviors. Michele Parkins is an occupational therapist, specializing in working with children with autism and sensory processing disorder. She is also a parent of two sensory kids. She works and lives sensational kids! Michele is a fellow of Dr. Lucy Jane Miller, OTR and faculty of Sensory Processing Disorder Foundation. She is faculty of Profectum academy, educating professionals on cognitive, social and emotional development using the DIR-FCD model. She co-developed a unique handwriting program – Connect Experience Write® – that highlights the importance of affective engagement in learning as well as sensory integration using music and movement to teach letter formation and pre-writing skills. Michele is passionate about working with families and other therapists and she continues to do so as a clinician and educator. She also continues to provide consultation to schools as she has done for over 10 years. Follow her on Facebook for updates and tips!